Show your love for Disney's Cinderella with this Sapphire crystal pendant necklace! 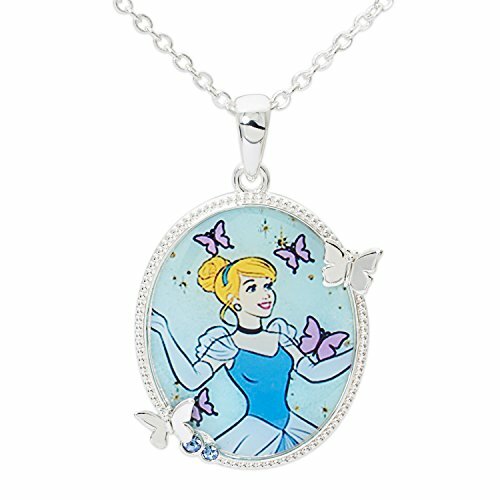 Official Licensed Disney's Cinderella Silver Plated Brass girl's pendant necklace are finished in gleaming brass, complete with an 18 inch chain with a spring ring clasp. This children's fashion necklace comes gift boxed making for a perfect gift for any woman including your daughter, sister, granddaughter, niece or any loved one. Gift box included making it perfect for all gift giving occasions for daughters, sisters, granddaughters or nieces including birthdays, anniversaries, Christmas, holidays, Valentine's Day or just for someone special. Disney Frozen Elsa Silver Plated Brass Pendant 18"